Fix: Why Can’t I Check-In Suddenly to my Facebook Page? *Update* Ensure your Facebook Page is also verified in order to allow check-in's on your page. If there is currently a duplicate Facebook page already verified with the same address as your business, that Facebook Page will supercede any other page to be able to allow check-in's. Did your Facebook Local Listing business page suddenly disappear from showing up in the Facebook check-ins? This seems to be a reported problem by many Facebook business owners in the recent months. It seems with Facebook’s recent roll-out of automated requests (Facebook page suggestions based on Facebook and community of users) suggest edits to Facebook pages which may include category edits. It seems some Facebook administrators accept category edits without knowing the update category may prevent your customers from checking into your Facebook Page. Be a Local Business with street address. Have Local Business as a category in your Facebook Page information. Enable show map and check-ins on the Page. It seems, though, even having the above information set on a Facebook Page, check-ins still don’t work. What most likely happened, you set a new category (based on a request suggestion Facebook emailed you) in front of your Local Business category which has caused confusion with Facebook. To fix, simply remove all other categories except Local Business and save your page. 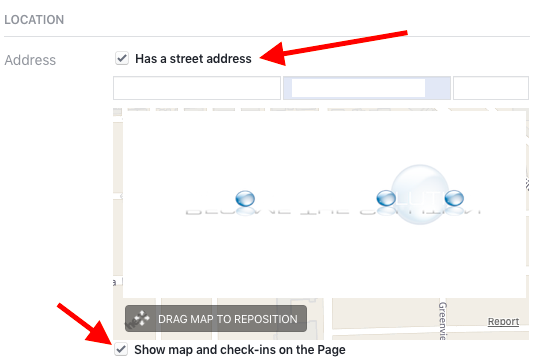 Also ensure your address is correct (a map shows your location) and you check marked show map and check-ins on the Page. Now, wait a few days or in some cases - up to 2 weeks for your Facebook page to show up again in check-ins. After it does show up, you can add other categories you want in addition to Local Business. Let us know if this worked for you and or share your experience.